Academician Sergey Nikolaevich Bagaev is an outstanding expert in the field of quantum electronics and laser physics. His scientific work and his formation as a scientist are associated with the Institute of radiophysics and electronics of SB AS USSR, where he began his research in the field of laser physics in 1960s. In IRE of SB AS USSR, S.N.Bagaev discovered new qualitative features in the absorption of laser radiation by gas at low pressure, which has allowed him to register very narrow spectrum lines on the doppler-widened transitions and to enhance the resolution of spectroscopy by 5-6 orders when compared to one that existed before the advent of lasers. From the very beginning of his career, S.N.Bagaev was in great friendship and fruitful cooperation with academician V.P.Chebotayev. 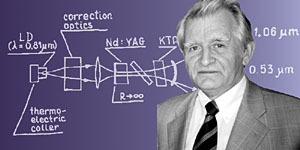 Because of their efforts, the Institute of laser physics has been created in 1991, and Sergey Nikolaevich became the director of the Institute in 1992. As of now, successful efforts are underway in the Institute of laser physics of SB RAS under the direction of S.N.Bagaev in various directions like nonlinear laser spectroscopy of ultrahigh resolution, laser standards of frequency and time and their application in high-precision physical experiments, creation of new laser systems and their application in medicine, biology, metrology, geophysics, industrial production, etc. Under the supervision of S.N.Bagaev, a complex program in creating various laser instrumentation is being realized. UV laser ophthalmologic installation, a laser scalpel, a laser stomatologic device, a laser gauge of small shifts for high-precision measurements of earth crust deformations, to forecast earthquakes and to monitor the steadiness of constructions, and a multi-purpose laser technological complex have been designed. S.N.Bagaev combines his research with an extensive scientific-and-organizational work. S.N.Bagaev gives great attention to the professional training; his disciples include 5 doctors and over 20 candidates of sciences. He heads sub-faculties and he teaches at Novosibirsk state university, Novosibirsk technical university, and Moscow physicotechnical institute. S.N.Bagaev is a member of editorial boards of some domestic and international magazines ("Quantum electronics", "Laser Physics", "Applied Physics B: Lasers and Optics", "Optical Review", "Opto-Electronics Letters"). The merits of S.N.Bagaev have been rewarded with the Order of People Friendship and with the State premium for 1998. On December 6, 2004, Mr. Jean Kade, the ambassador of France in Russia, presented the knight badge of the Honorable Legion Order to academician S.N.Bagaev, director of the Institute of laser physics for his outstanding contribution to the scientific cooperation between Russia and France, for his participation in creating the European scientific integration that includes 6 Russian and 6 European leading laboratories in the field of laser sciences, and for organizing the Laser symposium, expanding the cooperation in the field of fundamental science, education, and innovations. On September 2, 2006, academician S.N.Bagaev, director of the Institute of laser physics of SB RAS, the member of the presidium of RAS, was awarded with the Order "For the merits for the Motherland" of the IV degree by a decree of the President of the Russian Federation for his great contribution to the development of national science and for the long-term successful work. * Source: Syergyei Nikolayevich Bagayev // Kvantovaya ehlyektronika. - 2001. - T.31, N 10. - S.940. Statistika tsitirovaniya trudov S.N.Bagayeva za 1986-2006 gg. Dokumyent izmyenyen: Wed Feb 27 14:46:24 2019. Razmyer: 9,277 bytes.